Preheat grill to medium-high, 450–550°F (230–280°C). 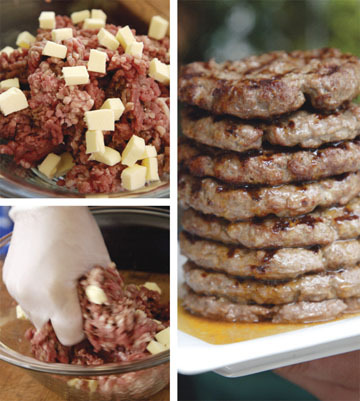 In a large bowl, combine the beef, butter, onion, garlic, parsley, Worcestershire sauce and Dijon mustard. Season to taste with cayenne pepper, salt and black pepper. Form into twelve 4-oz (120 g) patties as uniform in size as possible. 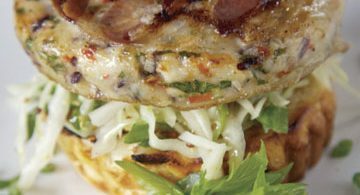 Grill burgers for 4 to 5 minutes per side for medium-well doneness. Brush burger buns with melted butter and grill, cut-side down, until crisp and golden brown. ASSEMBLE YOUR BURGER! Bun, burger, garnish with your favorite burger toppings, bun. NOTE: Everything is better with butter!